The football may be over, but the fun never stops! Using their statistics, I have compared the number of fouls committed versus the number of fouls suffered and plotted the scatter graph above. Fouls committed are on the x axis, fouls suffered on the y. The line is a (computer generated) line of best fit using linear regression. The greater the distance above the line, the more “saintly” we can say a team was – more fouled against than fouling; those below the line were the “sinners” of the tournament. Using my criteria, we can say that, despite not coming home with the trophy, England were the Saints of the World Cup! A few readers have (correctly) pointed out that the plot is skewed as not all teams play the same amount of games: one would expect France, Croatia, Belgium and England to all be towards the right of the graph as they played more games than other teams. 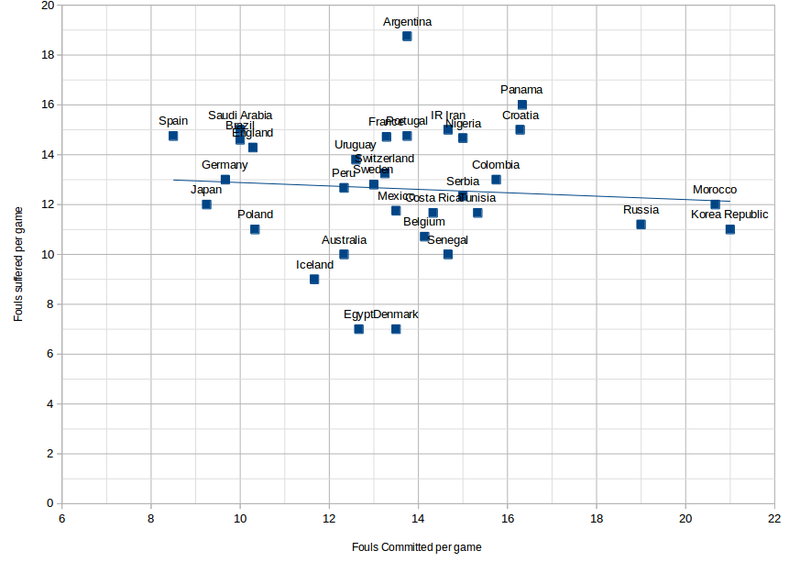 So I went back to the data produced a plot for fouls committed per game v fouls suffered per game. You can see the plot below. I think we can safely say those above the line were the saints, those below the sinners. This entry was posted in Handling Data and tagged data, football, sport. Bookmark the permalink. Post a comment or leave a trackback: Trackback URL.